I spent most of my time watching people with two oars, the multi-tasking sector of rowing. And exhilarating it was, too. The men’s and women’s quads were an extreme contrast. If there wasn’t six weeks of waiting before rocking up at Olympic Dorney, you could give the women’s gold to Ukraine now. They had time to take in the sights of the Rotsee, so dominant were they – the same crew but in different seats as won in Belgrade three weeks before. The Germans, who once dominated this event for generations, were about three lengths back and the rest, including the Brits, were fighting it out for the colour bronze. The men’s quads were totally different. Whereas Olympic champions Poland were off the pace and world champions, Australia, who had a substitute stroke on board, were relegated to the B final and beaten there by the Brits, there was a right old race for glory up at the front. Croatia, who won the first round and are into the fourth year of their ensemble, robbed the flighty Russians of the gold medal. Then the Germans robbed the Russians of the silver medal and the Estonians nearly got the bronze. This event is hot. The British quad looked a lot smoother in the B final than in the semi that sent them there. In the lightweight doubles, Zac Purchase and Mark Hunter seemed to be fooling around in the semi-final, doing enough to qualify but dropping to a cruise in the last quarter of the race. ‘We’re trying something new,’ they said, but when they flat lined in the final it was clear they were not fooling around. ‘It’s our Lucerne curse,’ Hunter told us. Zac had a minor bug that took them a step back. Apologies to all watching, said Hunter. But better to happen now than in a few weeks’ time. At the sharp end the Canadians led the charge and then faded. Former world champions Uru and Taylor (NZ) looked set fare, but it was the French Delayre and Azou who took gold, with veteran Danes Rasmussen and Quist behind the Kiwis in third place. The women’s lightweights was a struggle all the way, Sophie Hosking and Kat Copeland making their lives harder by getting entangled with the buoys at halfway, a mistake you can’t afford to make at this level. The medals went to the Chinese, Kiwis and Greeks, with the Brits beating the Americans in a battle for fourth. Watkins and Grainger had a good day in the open double. They lead all the way and held off a German attempt at ruffling them that went badly for the Germans in the end. The Poles beat them. This was the sort of race that the British crew yearned for; a race where things were not as easy as they have been, but a race that they could control. Five seconds separated the finalists in the men’s doubles, with GB’s Lucas and Townsend at the wrong end of the spectrum. However, these guys are on a learning curve, and the order in this race changed often. The French emerged on top but could not sustain it, being overhauled by Germans with a couple of hundred metres to go and then near the line by the Aussies. Slovenian vets Spik and Cop were also there or there about. Which brings us to the singular multi-taskers, the ones with no friends to help them. In the women’s race Australia’s Kim Crow was all set for gold until she crabbed near the end, and Zhang of China went through. Knapkova the Czech finished third behind Crow, with Azerbaijan’s Mustafayeva also in the scrap. Nobody crabbed in the men’s race, another contender for the single sculls hall of fame. Alan Campbell led at the first marker, Ondrej Synek at the second, Mahé Drysdale at the third, and Synek again at the line. Campbell’s start was blistering, but he couldn’t find his finish. ‘Hugely disappointed, to be truthful,’ he said. ‘I didn’t have the legs in the second half.’ Angel Fournier Rodriguez, the enormous Cuban and relatively a new kid on the block, went past the struggler in the last quarter to claim the bronze medal. Synek judged his race superbly, eking past Drysdale passing the last few lines of orange buoys. A race worth crossing the world to see. Especially from Cuba. The squadron of British supporters on the banks of the Rotsee didn’t know whether to cheer or cry, as one of those typically up-and-down Lucerne campaigns ended with four gold medals (one non-Olympic), one silver and a bronze, a big step down from Britain’s twelve medals in Belgrade. The race of the day for the Union Flag brigade was the men’s coxless fours surge through Australia, but the men’s eight’s bravura silver and a confidence-denting sixth for the lightweight double added equal drama. Australia’s four has completely changed personnel since the Beijing final four years ago, but that didn’t stop shivers of familiarity trickling down the spines of GB supporters as they watched their flagship crew once again lying second to the green and gold for more than a kilometer of a crucial race. The margin was never large – barely feet at times – but Australia were intent upon staking their claim to the class, and theirs was no brief flourish of speed but a relentless testing of the British stamina. Something special was needed, and though all of them say the crew still needs plenty of work, Alex Gregory, Pete Reed, Tom James and Andy Triggs Hodge can deliver strength and soul. Showing the dogged determination three of them had exhibited in that Beijing final, the power poured on, and they drove like a machine back through Australia to grab the win by just over a second. For Gregory, still white-lipped and shattered ten minutes later, it was a baptism of fire in the realities of Olympic fours racing. The men’s eight feels as if it is marking time until selected stroke Constantine Louloudis can rejoin the boat after a back scare. The heat and repechage were a return to the bad old days of playing catch-up, but in the final they pulled out their Belgrade belter start, and for the second time this year sat alongside Germany for much of the course. Silver again, by just over a second (again), but for once we glimpsed a view of the light at the end of the tunnel. “We kind of had the same plan the whole way through the regatta,” said James Foad, “and we just got it right today.” “In a broad sense we ticked the right boxes,” said Tom Ransley. “There’s stuff we still want to improve upon, but we still know the direction we want to go in.” This eight has the speed when it performs properly, but it has to start performing every time and growing in confidence. The peerlessly perfect crew of the day was the women’s pair, who rowed their way to the second gold of the season with unassuming fluency ahead of former rivals New Zealand. The Kiwis, in fact, ended up third, passed early on by the USA, who are looking like strong new challengers. Helen Glover and Heather Stanning arrived at the medal raft to a hug from coach Robin Williams and organisers offering them the yellow jerseys of world cup leaders for the second time this summer. With or without rib-fretted bowman Pete Chambers, the lightweight men’s four is virtually tested to destruction in every regatta. Despite leading for 1400m they could not resist China’s attack, and an assault by South Africa just as they were successfully holding off Denmark was too much to cope with. Yet, they were the right side of the line between bronze and fourth, and continue to be amongst the major players in an event which changes hands as often as the Olympic torch. The remaining sweep events left the men’s pair and women’s eight with fifth, both unable to cope with top-quality races. Will Satch and George Nash were well in the mix for bronze until halfway, but by then an all-out fist-fight between New Zealand and Canada had moved into another league, and the wash and inexperience took their toll and left them floundering four places behind the once-again undefeated Kiwis. The women’s eight has had a disturbed season, and fifth place on the Rotsee reflects a squad juggling returning injuries, oarswomen swapping disciplines, and three changes from the Belgrade line-up, not to mention a race which rapidly ran away from them. There is much to decide before this crew can finally get on track with its Olympic campaign. More from Lucerne — read about the sculling events in our second blog from Sunday on the Rotsee. What’s going to happen in the British women’s squad? The most vicious encounter on the Rotsee today was the fight between a huge aggressive swan and a kiwi. It looked one-sided as the champion NZ sculler Mahé Drysdale, cooling off in the lake after winning his quarter final, was attacked by a bird who realised that the intruder on his water could not fly. Three times the swan charged, spreading his immense wings. Three times the kiwi stood his water and fixed his gaze. On the third volley he rose up and raised a flipflop to strike his attacker. At this the swan recoiled and sailed away, and Drysdale lived to tell the tale to an intrepid Radio Berkshire reporter who gingerly rolled his trousers up and paddled into the lake. 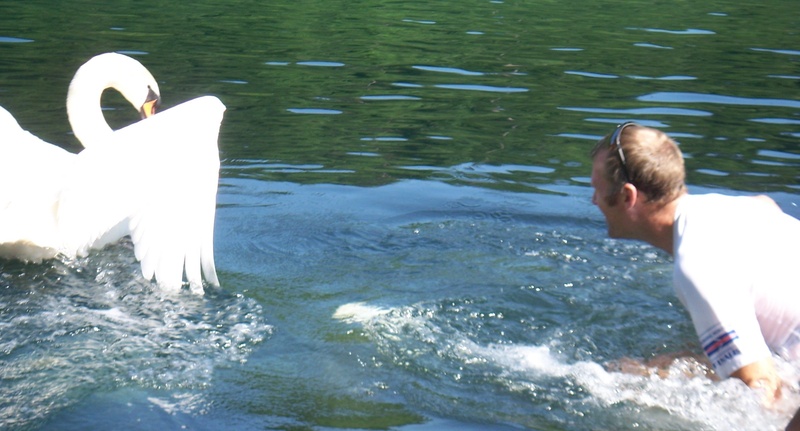 I understand the Swiss are appealing for swan uppers for next year’s regatta. Later, Drysdale stole first place in his semi-final from under Alan Campbell’s nose. He won by hundredths of a second after Campbell had led all the way. Ondrej Synek took the third qualifying place. Marcel Hacker won the other semi by a country kilometre. This was a new smooth, relaxed Hacker. Angel Fournier Rodriguez of Cuba followed him home easily with his sights set on China’s Liang Zhang in third. These three and the South African Peter Lambert dropped Olympic champion Olaf Tufte right at the start. Tufte was miles off the pace. But the Norwegian has come back from the dead before. The final is, as usual nowadays, a lottery among usual suspects Drysdale, Synek, Campbell and Hacker, with Zhang and the smiling Angel breaking down the door to the last six. The women’s event is without Ekaterina ‘Choco’ Karsten-Khotodivitch, the strongest woman on the planet. In her absence the finalists are Xiuyun Zhang (China), Mirka Knapkova (Czech), Emma Twigg (NZ), Kim Crow (Australia), Nataliya Mustafayeva (Azerbaiyan) and Ilia Levina (Russia). The second day was a Lucerne classic – sunshine, calm water with an occasional flutter of breeze, but not to the strength of the previous day’s record-assisting talewind. In a few years hence the Rotsee will become the New Rotsee if plans to rebuild the rowing centre and construct a new finish tower work out. Architects Andreas Fuhtimann and Gabrielle Haechler have come up with an imaginative design for buildings in a nature reserve, and other amenities are due for a scrub up as well. Britain’s men’s eight, still without its new stroke Constantine Louloudis— he hasn’t rowed in anger in it yet — and with the veteran star Greg Searle now in the bow seat, qualified for the final in a storming semi that was won by the Aussies. Coming into the season there was a blinkered view in some quarters that this event was between world champions Germany and GB. It’s clear, though, that the Canadians are going faster than they were in Bled last year, and ‘we haven’t finished yet,’ their coach Mike Spracklen told Voice today. The Australian boat is fizzing, and so are the Poles and the Dutch who ran the Brits very close in the rep. It is crucial, too, to remember Bled last year, when the American eight failed to qualify. The response of the Yanks to the unthinkable was to draft Mike Teti back into the national team and charge him with building an eight. What came out of San Francisco earlier this week qualified by clear Rotsee water for an Olympic place. They’ve gone back home to tune the engine. There is a lot more on board Teti’s boat than go-fast stripes. The overall British results were successful but salutary today — the appearance of four combative countries (Australia, New Zealand, USA and Canada) since Belgrade has considerably upped the ante. Ten boats progressed to finals as expected, to join the men’s four and women’s double scullers who qualified on Friday. The exception is the men’s quad who head for the B final. Difficult boats, quads, especially when their line-up changes, for whatever reason, every week or two. The women’s quad also faced failure, but managed to turn their Friday lack-lustre performance round today. The lightweight world and Olympic champion double scullers Zac Purchase and Mark Hunter led off their semi-final and then faded into the third qualifying place. Unusual tactics. It’s all right, they told Voice later —‘All OK. Good to try stuff. Bring on the medal!’ you heard it here first. In the men’s pairs, the Eric Murray and Hamish Bond continue the dominance that chased Hodge and Reed back to a four with their old Bejing mate Tom James. In the other semi George Nash and Will Satch had a fight with Niccolo Mornati and Lorenzo Carboncini of Italy and beat them, but were overhauled by the 2011 bronze winners Dave Calder and Scott Frandsen of Canada. The current state of play is that the Kanuks are probably about to inherit the silver slot, with the bronze up for grabs, and the new Brits in the running. Outstanding British performances were by the pair of Helen Glover and Heather Stanning and the lightweight four with Paul Mattick subbing for Pete with-a-damaged-rib Chambers. Both won their semis. Glover and Stanning fought off a challeng by the Americans Erin Cafaro and Eleanor Logan with a sprightly sprint at the finish. The four led a tight race all the way in a time a fraction slower than the other semi. No surprises there, then. Adam Freeman-Pask blasted out of the blocks in the final of the lightweight singles like a greyhound before the traffic light turned green. “I have 15 dogs at home,” he said. “I’m used to being chased by them, so my usual tactic is to run away.” At the second attempt he become Britain’s first winner at Lucerne 2012. He led the final all the way, seven days after being shifted to the solo boat. “A week’s notice to do the single is about right, otherwise I get bored,” he said. 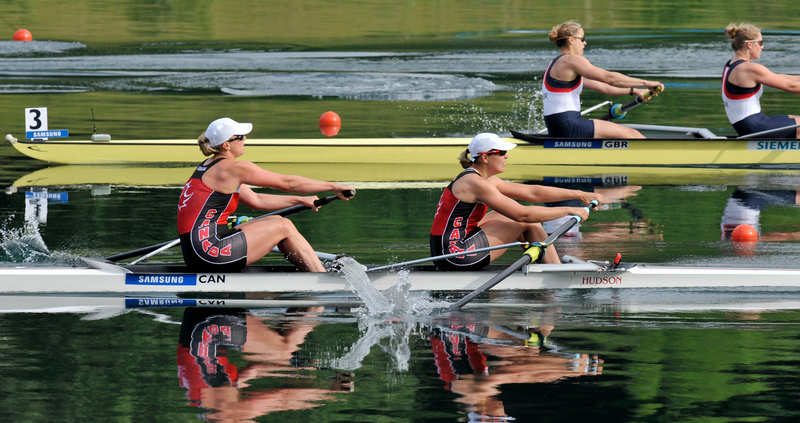 The B-final of the women’s pairs goes off the start on a mirror-flat Rotsee lake on Sunday 27 May 2012. This format is experimental, hope it is useful. Comments appreciated, and please press ‘like’ if you want us to do it again in future. The one thing it does not show up is in leisurely races, when the front two/three are bound to qualify, how much they slowed down. One example is the first W2x heat, where Grainger and Watkins could afford to take their feet off the gas long before halfway but it looks like a close race. Crews in orange are through to the A-final or have already raced it. Results will be updated as the regatta goes on. In Olympic classes, 3 GOLD, 1 SILVER, 1 BRONZE, 2 4th, 3 5th, 2 6th, 1 7th. In non-Olympic classes, 1 GOLD, 1 4th. — won heat in 6-47.54 by 2sec, to final. Other heat winners 6-40.41 (POL, by 8sec). — WON GOLD MEDAL (8 world cup points, world cup leaders). — 4th in heat 6-15.18 behind GER1 (6-09.38), USA1 (6-10.09) and CHN (6-11.55), to rep. Other heat winners 6-13.79 (UKR, by 4sec). — won rep in 6-19.69, to final. — 5th in A-final (3 world cup points). — won heat in 7-05.93 by 5sec, to SF. Other heat winners 7-06.40 (USA1, by 7sec) and 7-15.29 (NZL by 12sec). — won SF in 6-56.61, to final. — 2nd in heat 6-01.85 behind USA (5-54.17), to rep.
— 3rd in rep behind NED, AUS, to final. — won heat in 7-47.93 by 4sec, to final. Other heat winner 7-36.81 (AUT, by 14sec). — 2nd in heat 6-52.66 behind NZL (6-49.43), to rep. Other heat winners 6-49.46 (GRE, by 4sec). — 2nd in rep in 6-55.46 behind DEN, to final. — 4th in A-final (4 world cup points). — won heat in 6-48.24 by 12sec, to QF. Other heat winners 6-47.18 (GER1, by 9sec), 6-50.42 (LTU1, by 4sec), 6-57.35 (SWE, by 6sec), 6-46.30 (NZL, by 7sec), 6-53.55 (CZE, by 3sec). — won QF in 6-58.66, to SF. — 2nd in SF in 6-44.32, to final. — 3rd in heat 6-19.20 behind AUS1 (6-18.11) and NOR (6-18.93), to SF. Other heat winners 6-19.01 (GER, by 1sec) and 6-20.67 (FRA, by 3sec). — 3rd in SF 6-12.12 behind AUS1, GER, to final. — 6th in A-final (2 world cup points). — 5th in heat 5-39.40 behind RUS (5-33.15), NZL (5-35.90), AUS and EST. Other heat winners 5-35.10 (CRO, by 3sec). — 3rd in rep in 5-42.85, to B-final. — 7th in B-final (1 world cup point). — 2nd in heat 6-34.90 behind AUS1 (6-33.54), to SF. Other heat winners 6-27.02 (NZL, by 3sec) and 6-34.89 (ITA, by 2sec). — 2nd in SF 6-23.08 behind CAN1, to final. — 3rd in heat to NSL, to SF. — 5th in SF, to B-final. — won B-final (no wcup points as they’re a second crew). — won heat in 5-37.86 (WBT) by 8sec, to F. Other heat winners 5-44.70 (AUS, by 4sec). — 3rd in heat 5-22.71 behind CAN (5-19.35), to rep.
— 2nd in rep 5-23.56 behind AUS (5-23.23), to final. — SILVER MEDAL (6 world cup points). — won heat in 7-02.80 by 5sec, to SF. Other heat winners 6-59.81 (AUT, by 4sec) and 7-07.27 (GER1, by 4sec). — won SF in 1-41.52, to final. — 2nd in heat 6-30.87 behind FRA (6-27.54), to SF. Other heat winners 6-27.72 (GER, by 3sec) and 6-25.87 (NZL, by 2sec). — 3rd in SF 6-21.46 behind NZL, CAN, to final. — 2nd in heat 5-59.22 behind CHN (5-56.71), to SF. Other heat winners 5-57.65 (RSA) and 5-59.12 (AUS). — won SF in 5-51.63, to final. — BRONZE MEDAL (5 world cup points). The presence of a former headmaster at the helm of GB Rowing often makes the urge to give the team a report card instead of a write-up overwhelming. After the opening day of the 2012 Lucerne world cup, with four crews in finals but both quads and eights in risky Saturday repechages, the verdict would be “not quite fulfilling the potential”. And the fact that the flagship men’s crew has become the quickest four ever to race 2000 metres, doesn’t disguise that. As news of the coxless four’s record time filtered through the Twitterverse, and a rush of other countries followed breaking several long-held records, it overshadowed the fact that Team GB’s success level was quite dented by the appearance of Australia, New Zealand, Canada and the USA, all of whom were largely absent from the first world cup regatta. Second place for all three Olympic lightweight crews and the women’s eight, together with third for the men’s eight, is a step down from the Serbian results — at this point three weeks ago, 14 of the team’s 19 crews were unbeaten. If we want to match or outdo the Beijing medal record, more is needed. The context is important. The women’s eight has been reshuffled again, is still without stroke-woman Polly Swann, who is being coddled to prevent long-term repercussions from a back injury, and has just regained the talents of Annabel Vernon and Debbie Flood. These two experienced scullers are not only slightly rusty in racing terms, but also must still be adjusting to the different demands of sweep rowing, which takes a while, however good you are. Fortunately there are enough crews here to require heats and a rep, which may be the eight’s saving grace. On Friday being drawn against world champions USA, on a mission to beat their own record time, left second place the only realistic option, and the first half of the GB race was good enough to encourage optimism for now. The men’s eight also still lacks its injured selected stroke (Constantine Louloudis) and though James Foad led a rearranged crew order with dogged determination, the flair which had the crew leading Germany for a part of the Belgrade final was absent and will need to be rediscovered before the final. Canada’s 2011 eight may have returned to the scene with surprising (and record-beating) speed up its sleeve due to a seating reshuffle, but if GBR have any intention of being on the Olympic medal rostrum, they have to be right alongside an eight that a weaker British crew beat last summer. A win in the rep is a minimum now. The same is true of the women’s quad, unchanged since Belgrade and showing a dead pedestrianism on Friday which is not a fair reflection of these four oarswomen’s talent and verve. The last seat in the men’s quad has now been confirmed for Tom Solesbury (sending Marcus Bateman to a trial in the eight this weekend), and the seating order has also been confirmed with Charles Cousins at stroke and Matt Wells behind him, but it has not yet yielded results. Russia tore the heart out of the pack and hacked two seconds off the new world best time which had just been set by Croatia, but that is no excuse for GBR to be content with fifth place out of five crews, even if they were once again only three seconds off what would have been record pace last week. The four was sparkling, and the women’s pair, women’s double and Alan Campbell also won their heats comfortably, as did lightweight spares Adam Freeman-Pask and Kathryn Twyman. That’s a thin list compared with Britain’s usual clutch of first places, but one reason was the common sense shown by crews in tight events. All three lightweight crews, and the men’s pair and double, faced the challenge of rivals desperate to win races at any cost. The GB response, though it won’t satisfy those who insist the only way to get to the final is unbeaten, was mature. It’s important to remember this week that the only result which will count is Sunday’s and that sometimes an early loss can lead to a later gold. So what if France’s LM2x reached the line first? GBR’s Mark Hunter and Zac Purchase clearly have more in the bank and after some of their previous Lucerne experiences it makes sense to save energy for the fights which matter. The same was true for Will Satch and George Nash, initially looking likely to win as well as easily qualify, but rumbled by Australia’s late-sprinting James Marburg and Brodie Buckland. The latter is a former Oxford oarsman who was probably spurred on by the prospect of beating Light Blue Nash. Satch and Nash will go faster in Saturday’s semi-finals, but they will need to, with the Kiwis setting a good pace. Paul Mattick deputised for the injured Pete Chambers well in the men’s lightweight four, and it looked as if they also settled for second as best pro tem, well ahead of the cut-off for the automatic semi-final qualification. The tiny LW2x entry meant that second sent lightweights Sophie Hosking and Kat Copeland to the rep, but pacing uneven-ness suggested it may do them a power of good ahead of Sunday. In the men’s doubles Australia’s Olympic champions Crawshay and Brennan read the race beautifully to win at a canter leaving Bill Lucas and Sam Townsend having to speed up in the final quarter to stay close behind. It’s more worrying that the Britons were beaten by Norway, and they need to beware that small slips can cost several places in this tight event. So, the British team is still a work in progress. There was plenty to cheer, but some causes for gentle concern. Time is running out, both for the injuries to heal, and for the interim crews to get racing experience in their final combinations. Two more days to go here, and three in Munich. And then come the Olympics. Read the Rowing Voice blog here for more analysis after Saturday’s racing in Lucerne. The GBR Olympic team will still be announced on 6 June 2012, but it looks increasingly likely that some crews (probably including the women’s eight) may not be confirmable on that date. If need be unfinished crews can be announced later. Medals are what they are really after, but today the GB men’s coxless four bagged a world best time, something many superb athletes have never done. More than that, they smashed it to pieces, hacking 3.49 seconds off the time set 10 years ago by Germany on a scorchingly hot day in Seville, on one of rowing’s quicker courses. This time the venue was the Rotsee in Switzerland, known for great tail-winds but considerably colder than the dammed and shallow Spanish river. It wasn’t down to close racing, either. Britain had the best part of three lengths advantage on New Zealand, their nearest challengers, by the finish line. This was speed, pure and simple. Andy Triggs Hodge, Tom James, Pete Reed and Alex Gregory were not thinking of world records when they woke up this morning. “We’re here to win races, the margin’s irrelevant,” said James. But then at 12:09 local time the stars began to align. “We were aware of the conditions on the start line, and a bit of cross-wind picked up, we had to point the bows into it before we raced,” said Gregory. The natural corridor shape of the Rotsee (“Lake of the Gods” in both Swiss and rowing terms) means that even a cross-wind at the start tends to be funnelled into a straight head- or tail-wind by the time the crews have got up to speed. As they turned and paddled back past the grandstand, the over-excited journalists yelled the news to the crew, who whooped with uncharacteristically undignified delight. There was another ripple of celebration as they passed the massed parents further on, shouts of “really? what was the time?”, and cheers. By the time they landed, the record-breaking time had been confirmed, with Australia winning the second heat in 5:44.70, 4sec outside Germany’s 2002 mark. As soon as the Brits had broken through the barrier, records started to fall thick and fast: the lightweight women’s doubles, women’s quads, men’s and women’s eights, and men’s quads (twice). None by as much as the British four, despite relatively steady wind until it died down just before the last eights race. As a statement of intent and ability, it was a pretty good one. Follow us on Twitter for all the latest from the Rotsee this weekend.